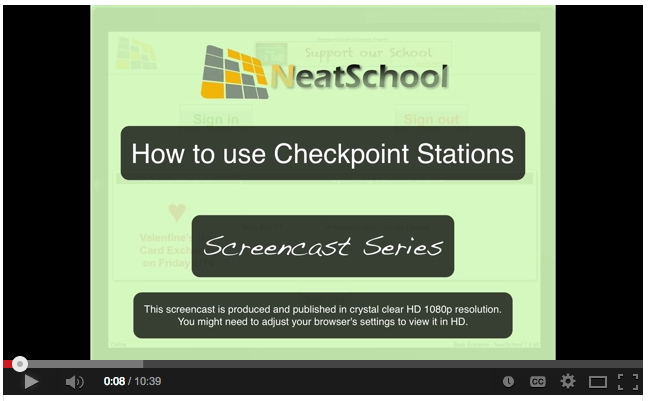 NeatSchool Checkpoint and Classroom stations are tablets or PCs deployed in your premises that serve multiple purposes. First, they automate and move online the sign-in and out process for both Parents and Staff Members. They eliminate the need to print and make sheets available and automatically calculate the staff hours for payroll. Second, they provide a Student Roster including the always most up to date emergency contact and allergies/medication information. Finally, in a classroom setting, staff can use to report events and activities as they happen and keep parents, students and other staff members on the same page. We recently posted two YouTube screencasts on how to set up a station and how a Staff Member or Teacher can use it. You can find the screencasts in the help section of the Dashboard or e-mail us for the links.